Less than a week after Russia marked its annual Victory Day commemoration of the end of the Second World War, NATO troops began planned military exercises in Estonia all the way up to Russia’s border. It begs the question – are these people actually mad? Many countries and many people suffered enormously during World War Two. It was the first conflict in history in which technology played a dominant part in the air, on land, and at sea, allowing for the development of weaponry of unparalleled destructive force, power, and reach. Add to this the brutality and barbarism of the fascist ideology that underpinned the war, with its objective of eradicating entire peoples from the earth, the carnage that ensued was inevitable. No country suffered more than the Soviet Union over the course of the war, and no people suffered more than the Russian people, who made up the vast bulk of the Soviet population. It is estimated that between 25-30 million Russian and Soviet citizens perished, while the country itself was devastated, turned upside down and inside out. Consequently, this is a conflict that left deep and eternal scars on the Russian psyche. It is something that Western ideologues either fail to understand, or do understand and don’t care. How else are we to explain NATO military exercises in Estonia starting in the wake of the annual Victory Day commemoration? How else are we to explain the said exercises being conducted on the Estonian-Russian border? 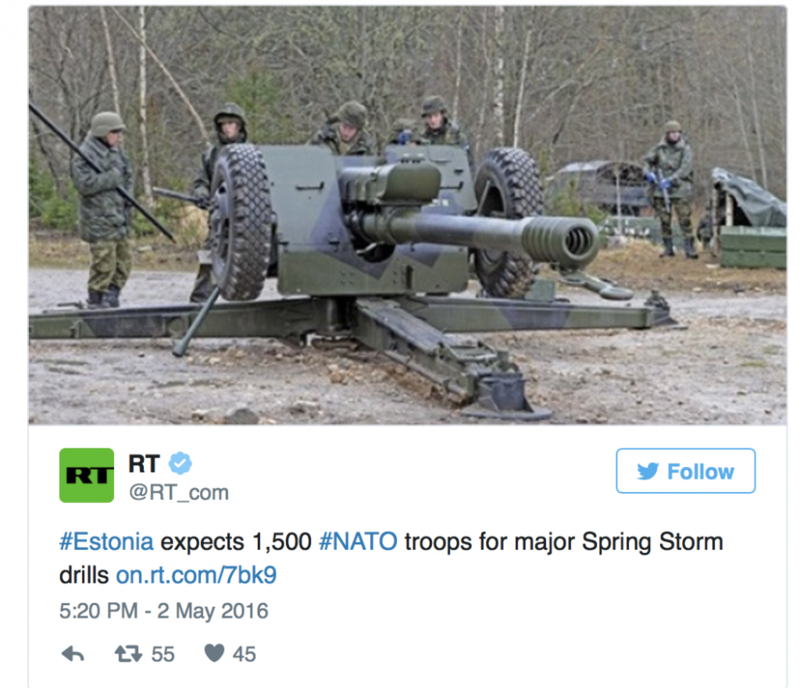 Above all, how are we to explain that among the 5,000 or so NATO troops taking part are German and Estonian troops? If this doesn’t qualify as a provocation, what does? Why is the West and NATO intent on pursuing a cold war strategy when it comes to Russia? How can it possibly profit Western countries and their citizens to experience a return to the decades of enmity previous generations endured, with all the dangers that such a state of mutual antagonism brings? Russia considers its security to be every bit as precious and non-negotiable as the US, UK, France, Germany do theirs, with its people and government reminded of the centrality of security to the nation’s wellbeing each Victory Day. A nation that lost and sacrificed so much in the war against fascism seven decades ago would be remiss if it did not refuse to countenance any attempt to weaken or probe its defenses today. It simply cannot be allowed to happen. Yet despite what should be a matter of basic logic, we have countries on Russia’s border – Ukraine, Estonia, Georgia et al. – doing their utmost to cause tension and discord. In the case of eastern Ukraine in 2014 and Georgia in 2008, conflict was the inevitable result, and is evidence of Washington and the West’s refusal to consider any other option when it comes to relations with Russia than vanquished enemy or deadly foe. It is also relevant to ponder the benefits the countries on Russia’s border have enjoyed or are enjoying as a result of their turn to the West. Ukraine, the second largest country in Europe after Russia, is today an economic and political basket case. The decision to sever all economic and political ties with Russia has caused living standards to fall by more than 50 percent in a year, while the value of its currency (hryvnia) has dipped by two thirds. Inflation, meanwhile, has risen to a whopping 43 percent. Forced to rely on IMF bailout loans in order to forestall complete economic collapse, Ukraine is a prime example of Western promises not being matched by Western reality. For Western governments the plight of the Ukrainian people comes low on a list of priorities dominated by strategic and self serving objectives. In other words, if the price of weakening Russia is misery and economic collapse for Ukraine and its people then so be it. Estonia has fared significantly better than Ukraine as a result of moving into a Western orbit. Indeed, in terms of growth and innovation there is no doubt that Estonia has been a success story, even though its economy is highly indebted to external creditors. However the sustainability of Estonia’s economic success and stability is contingent on stable relations with Russia. The more stable those relations the more stable the Estonian economy, and vice versa. It is a simple equation that the Estonian government appears to have great difficulty in grasping, given its desire to join NATO and have NATO forces permanently stationed on its territory. Such a course can only lead to a bad outcome. Given its recent history, when invasion and occupation decimated its land and people, Moscow cannot be expected to acquiesce to NATO expanding all the way up to its borders. Indeed the very idea is preposterous, and would immediately turn countries such as Estonia, Latvia, and Lithuania from neighboring states into frontline states, with all the potential and inherent dangers involved. Ultimately, common sense must prevail. The 25-30 million who perished in the war against fascism did not do so in order for Russia to stand idly by while the West, its allies in that struggle, attempts to box it in with what is tantamount to a military, economic, and geopolitical cordon sanitaire. It really doesn’t have to be this way. Russia and the West do not have to be enemies. They can also be partners. Moreover, in a globalized world facing global threats and challenges, there is no longer any excuse for cold war attitudes. The millions living in the countries concerned surely deserve better.